Markings: The right side of the barrel is marked “40 S.&W. / 022788MN”. The left side of the frame is marked “070649MC CAT.7917”. The right side of the slide is marked “MOD. 8040 COUGAR F – PATENTED / BERETTA USA CORP. ACKK. MD”. The left side of the slide is marked “PIETRO BERETTA GARDONE V.T. – MADE IN ITALY” and a “PB” in an oval. The right side of the frame is marked “READ MANUAL BEFORE USE” and Italian proofs. Sights / Optics: The front sight is a white dot blade dovetailed into the slide. The rear sight is a square notch two white dot square notch which is dovetailed into the slide. 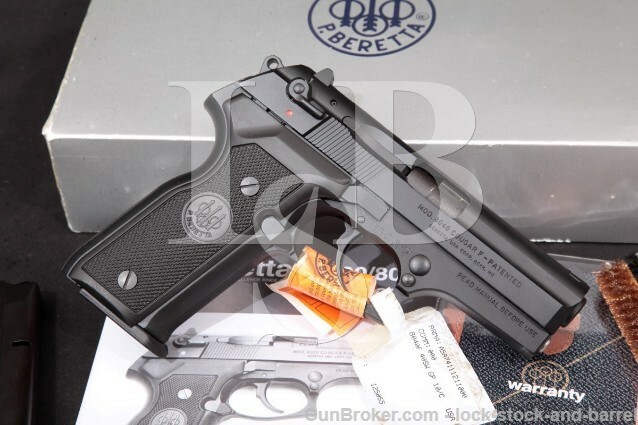 Stock Configuration & Condition: The grips are checkered plastic with Beretta logos on them. There is little to no wear on the grips. There are no chips or cracks. The grips rate in about Excellent overall condition. Overall Condition: This handgun retains about 99% of its metal finish. There is light operational wear on the barrel. The serrations on the front of the trigger guard, the slide, and the front and backstraps are sharp. There is a small knick in the finish on the left slide serrations. The grip screws are sharp. The markings are clear. Overall, this handgun rates in about Excellent condition. Mechanics: The action functions Correctly. We did not fire this handgun. Box, Paperwork & Accessories: This pistol comes in its blue molded plastic case, factory paperwork,anti rust paper, cleaning rods, and two 10-round magazines. The magazines show little to no wear. The box’s serial number matches the gun and rates in about Excellent condition. Our Assessment: The Beretta 8040 Cougar series is a thoughtful and well-engineered design which features some innovative design elements and was introduced in 1994. This pistol uses a rotating barrel locking system, which gives a tight lock up and which may help reduce recoil. The controls duplicate the popular and ubiquitous Beretta 92 F, yet carry 10 +1 rounds of .40 S&W punch and conceals slightly easier with a barrel 1.3″ shorter than the Beretta 92. If one is looking for an off-duty or backup weapon, or for home protection, this compact pistol will fit the bill! We believe that this pistol has not been shot outside of the factory….The original tags on the trigger guard are still present. Pick up this Excellent rated pistol today! CA Legal or CA Private Party Transferable: This handgun CANNOT be transferred as a dealer sale in California. This handgun CANNOT be sold as a Private Party Transfer (PPT) at our Simi Valley shop. This section does not apply to out of state residents.